Mission integration operations are in full swing right now as technicians were actively processing Antares hardware in order to resume launches of critical cargo missions to crews living aboard the space station, during my visit to Orbital ATK’s Horizontal Integration Facility (HIF) at NASA’s Wallops Flight Facility in mid-December. “We are working on integrating, processing and testing the Antares rocket hardware,” Mike Pinkston, Vice President and General Manager Orbital ATK’s Antares program, told Universe Today in exclusive interviews at NASA Wallops and the Kennedy Space Center. Technicians are simultaneously processing two sets of Antares hardware intended for the first two launches, one of which will also be used to conduct a critical engine hot fire test in March 2016. The cavernous Wallops Island HIF facility was filled from end-to-end with a pair of first stage cores, newly upgraded RD-181 first stage engines, a second stage, interstages, payload fairings and other key components slated to launch on the first two Antares missions in the late spring and fall of 2016. “We are in the final throes of the integration process now,” Pinkston told Universe Today. The currently planned spring 2016 blastoff will be the first for the private Antares rocket since a catastrophic launch failure on Oct. 28, 2014, just seconds after liftoff from Wallops. It was carrying Orbital ATK’s Cygnus cargo freighter on the critical Orb-3 resupply mission for NASA to the International Space Station (ISS). The launch mishap was traced to a failure in the AJ26 first stage engine turbopump. Pinkston emphasizes that Orbital ATK is fully committed to fulfill the firms station resupply contract commitments to NASA and the station crews in the wake of the Cygnus Orb-3 mission failure. I was an eyewitness to the failure and watched the disaster unfold from the Wallops Island press site less than 2 miles away. NASA recently supplemented the original CRS contract with three additional Cygnus resupply deliveries in 2017 and 2018. The revamped Antares 230 launch vehicle has been upgraded with a pair of modern new first stage engines, the Russian-built RD-181 fueled by LOX/kerosene. They replace the refurbished 40 year old AJ26 engines originally known as the NK-33 that were originally built during the Soviet era. “Using the RD-181s will result in a 25 percent greater payload to orbit,” Pinkston told Universe Today. But before any launch, the fully integrated Antares first stage still has to pass a full power hot fire test with the new RD-181 engines at launch pad OA on Wallops Island. Teams are currently performing final testing and certification to prepare for the hot fire test. A similar 30 second hot fire test was conducted in advance of the first Antares launch to test out all rocket and launch pad systems. The first Antares booster to launch will be named the OA-5 mission and will use the other core stage currently being processed inside the HIF, he explained. During our media visit, the first set of RD-181 engines was seen already attached to the base of the first stage core, which is built by KB Yuzhnoye/Yuzhmash in Ukraine. And despite the ongoing civil war in the region, there has been no effect on core stage production, Pinkston stated. 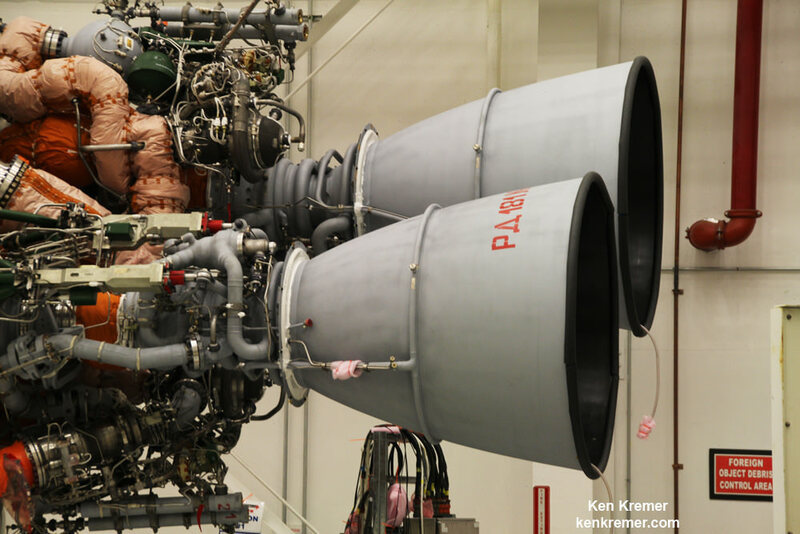 A second set of RD-181 flight engines built by Energomash in Russia has also arrived for processing in the HIF. Orbital ATK quickly decided to replace the troublesome AJ26 with the RD-181 soon after the Orb-3 accident. Evaluations had already been in place to replace the AJ26 prior to the Oct. 2014 accident. “Shortly after the accident we put a plan in motion, one that had been in the works for awhile, to put new engines on Antares,” Pinkston elaborated. What changes were made to accommodate the RD-181 vs the AJ26 engines? “The changes to Antares are the new engine itself, the RD-181. We designed and built a new thrust adapter structure that interfaces the engine with the aft end of the RP [propellant] tank,” Pinkston told me. “Thanks to the tremendous dedication of our workforce and support from NASA, the FAA, and Virginia Space we are once again in a high-operational tempo at Wallops, leading to the launch of an upgraded Antares vehicle with our Cygnus spacecraft to resupply the ISS,” says Pinkston. 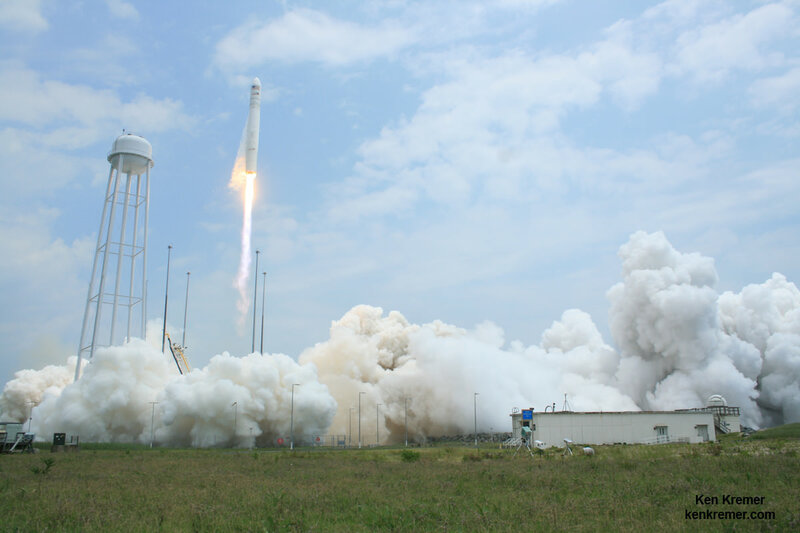 Earlier this month, the Orbital ATK Cygnus cargo freighter already accomplished its return to flight mission when it was launched to the ISS on the OA-4 mission (also known as CRS-4) using a United Launch Alliance Atlas V rocket for the first time. Cygnus OA-4 successfully lifted off on Dec. 6, 2015 with over 7000 pounds of cargo from Cape Canaveral, Florida – as outlined in my on site reports. The ship berthed at the ISS on Dec. 9. I’m glad Wallops is shaping up since Cape Canaveral may be under water before long. I guess NASA needs to have a word with their real estate agent. Now that is one HUGE garage! I tried to find the dimensions of the building.. no dice.. yet. Do you have those specs.? Next PostNext Will 2016 Be the Year Elon Musk Reveals his Mars Colonial Transporter Plans?